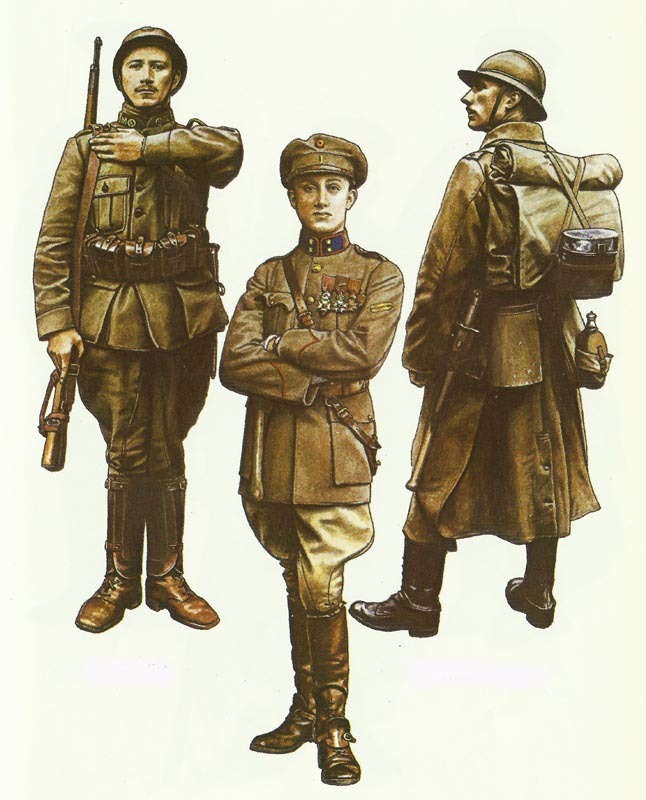 Uniforms, strength, organization of the Army of Belgium in World War One. Belgian soldiers on the march to the front 1914. Standing in the route of the main German push of 1914, Belgium set up a field army of 6 infantry divisions adding up to a number of 117,000 soldiers, and 3 fortress garrisons: Antwerp, Liege, and Namur. Due to the fact Belgium was neutral, 2 infantry divisions faced France, a single at Antwerp, Great Britain, just one at Liege, Germany, with the remainder in major reserve. Counting on her neutrality, Belgium had ignored her military. Service in the Belgian army had been unpopular, exercising seriously restricted, spirits weak, the officer corps critically disunited. The fortresses ended up outdated, upgrades intended in 1882 remained as not finished coupled with at this point been themselves surpassed by artillery development. There seemed to be a single brilliant spot, however, King Albert, 39 years old, had been smart as well as heroic, and he had superb personal integrity. He didn’t command the military in peace times, however when World War One started he was required by the constitution to control the Belgian army. Belgian Army 1914 /from left to right): Carbinier cyclist, Infantry officer, Infantryman. In 1914 Belgian uniform was in the process of transformation. The Royal Decree of 19 September 1911 modified officers’ uniforms as well as the rank badges for subalterns. A circular of 26 March 1913 replaced the stiff tunic and elaborate Dolman with a more practical tunic or vareuse, and changed the facing colour of infantry from scarlet to grey blue. The typical campaign dress worn by officers is illustrated on the right picture. In place of the kepi officers also wore either their distinctive head-dress or the side cap. Both the double-breasted tunic and M.1863 Dolman were replaced in 1913 by a new pattern tunic, but they continued to be worn out. The M.1913 tunic was single-breasted with stand collar, passants, nine gilt metal buttons down the front, slanting slash breast pockets with rectangular flap and button, and slash side pockets cut on the curve with flap, round or pointed cuffs with a rectangular patch and three buttons on the outside, and dummy pockets at the back with two dummy flaps each with two buttons. The front and top edge of the collar, the front, cuffs and pocket flaps were piped in facing colour. The greatcoat was the peace-time model which was double-breasted with fall collar and two rows of five gilt metal buttons, side pockets with flap, half-belt and vent at the back both fastening with two buttons. Mounted officers wore an elbow-length cape. Breeches were grey blue with piping, stripe or Lampassen, and were worn with riding boots, ankle boots and leather gaiters or puttees. Other ranks wore the uniforms illustrated again in the right picture. Grenadiers wore a German pattern field cap with scarlet band and piping, while Carabinier cyclists wore the conical field cap illustrated right with chin strap and peak. 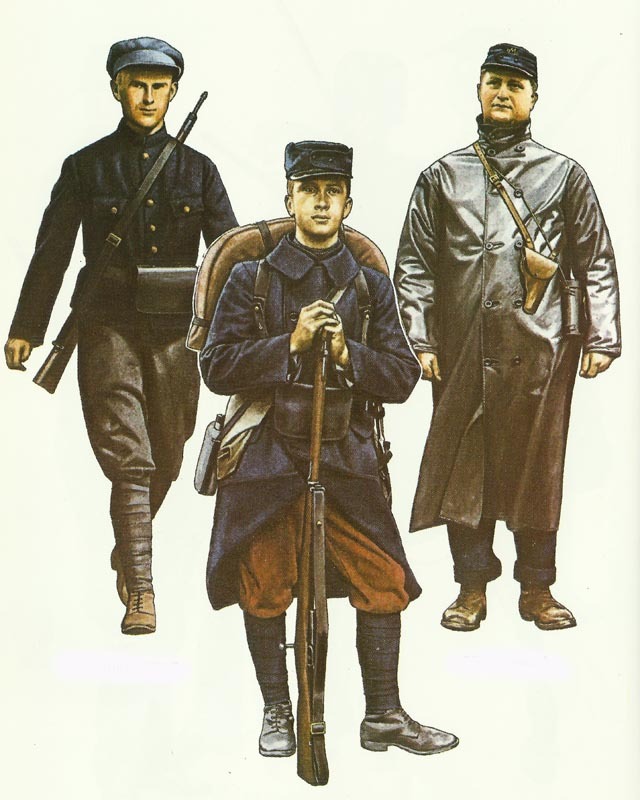 Belgian Army 1915 (from left to right): Infantryman, Infantryman, Sergeant. These peace-time uniforms were totally unsuited for modern warfare, and almost immediately more practical uniforms began to be made available. It was known as the ‘Yser’ uniform since it was mainly worn by the 58,000 men fighting on the River Yser. The distinctive head-dress and coloured field caps were replaced by a soft blue or green kepi with piping in arm colour around the crown. The tunic was either dark blue or grey and was single-breasted with stand collar and seven grey metal buttons down the front. It had pleated patch breast and side pockets with rectangular flap, pointed cuffs piped in the arm colour, and dummy pocket flaps at the back each with two buttons. The blue-grey trousers were replaced by wine-red corduroy (satin) ones which were worn with blue puttees and ankle boots. 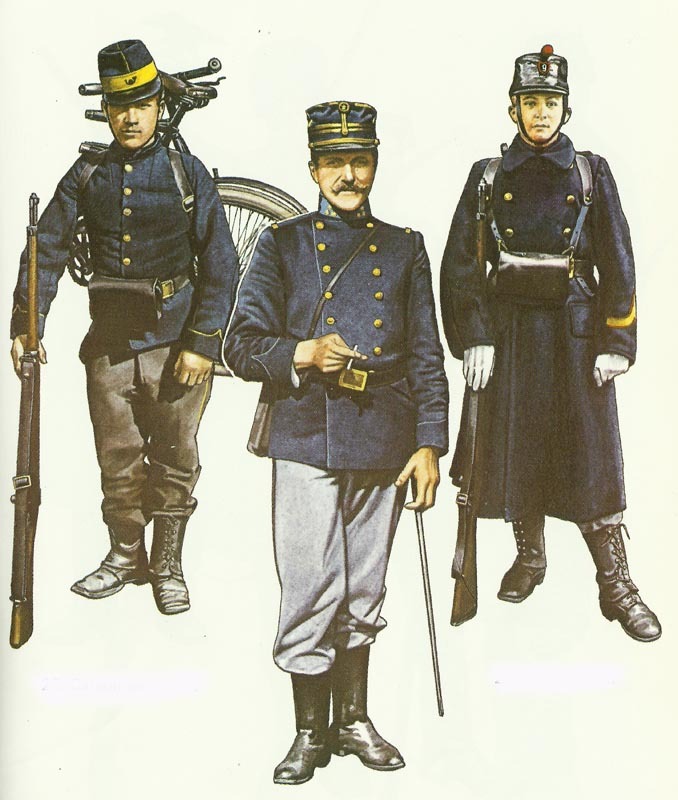 Short­ages of the Belgian uniforms were made good from stocks of French uniforms. In the spring of 1915 the Belgian Army adopted khaki, not so much because it was the colour of their choice, but because Britain could supply sufficient material. The officer’s uniform was closely modelled on the British pattern while the uniform of the other ranks resembled that of the French. Shortages of the correct Belgian pattern were made good from British and American stocks. Belgian Army 1916-1918 (from left to right): Cyclist, Artillery officer, Infantryman. The peaked cap was khaki with matching cloth-covered peak, brown leather (gilt cords for generals) chin strap, and row of piping in arm colour around the crown. Generals had a crimson cap band. On the front was worn the unit or arm badge in either metal or embroidery, with above it the circular cockade in the Belgian colours – red, yellow and black. The side cap had a tassel and piping in the arm colour for other ranks, and tassel and trimming according to rank for officers. Typical officers and other ranks uniforms are illustrated on the right picture. The other ranks’ greatcoat had two rows of five bronzed buttons, vertical slash breast pockets and side pockets with flap. Shoulder patches were fastened on the shoulder with a button at each end, and were piped in the arm colour. Officers’ greatcoats came in a variety of cuts with many detailed differences between one and another, but were generally in the same cut as the peace-time coat. Breeches and trousers were piped for officers, while non-mounted other ranks had matching khaki pantaloons for wear with ankle boots and either leather anklets or puttees. Mounted personnel and cyclists had breeches and leather gaiters. Towards the end of 1915 the French Adrian helmet with lion’s head on the front began to be issued to Belgian troops. In August 1918 the Italian Farina helmet and body arm our underwent tests but was never adopted. In December 1918, a Belgian-designed helmet, known after its designer Weekers, was put into limited production. It was unusual in that it had a visor, and a circular stamped metal cockade in the national colours on the left side. At the beginning of the war infantry equipment consisted of a black leather waistbelt from which was suspended a single cartridge pouch in front, and a bayonet and Linnemann entrenching tool on the left hip. A canvas haversack and cloth-covered aluminium water-bottle were sus­pended from the right shoulder. The pack had a cowhide flap on which was strapped the black painted aluminium mess-tin. In 1915 equip­ment began to be manufactured in brown leather, and a new leather waistbelt with integral ammunition pouches began to be issued to mounted troops and cyclists. Towards the end of the war new web equipment began to be manufactured for the Belgian army in England.